I lost a filling last week–fell out at the breakfast table. Initial reaction:–Oh no! dentist visit(s), hassle, painful, waste of time–damn! Then: Ouch! Jagged bit left causing pain, hard to swallow. So—looking for something that slips down easily—I thought to combine these two recipes for dinner. Result: Sigh! Temporary distraction. It worked—they melded deliciously and skipped down with ease. Place the leek pieces in a shallow pan. Season with salt and pepper. Pour in the wine and water, then add the butter. Put on the lid and bring up to a simmer. 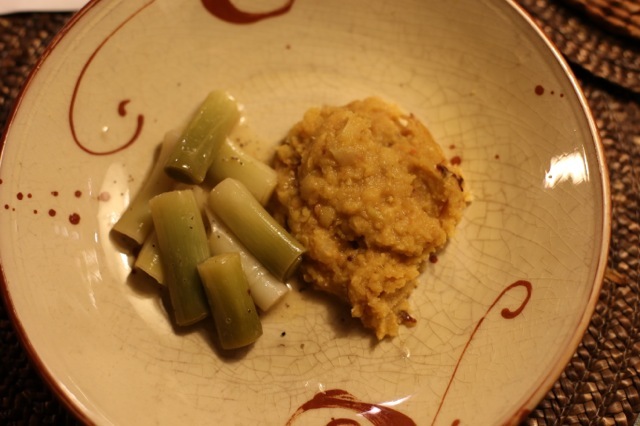 Cook over a low heat for about 20 minutes – the leeks should be beautifully tender. Meredith tells me the first time she became aware of lentils, was at the age 35. They had not been part of her experience growing up in suburban Chicago! Much has changed–Indian restaurants are commonplace now in the US. This recipe is hands-on for the first half hour or so, as it builds in the taste. 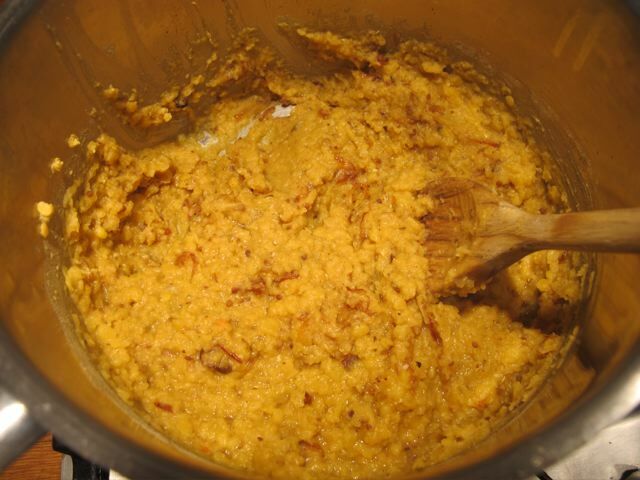 Then it chugs along on a low heat for 50 minutes as the lentils dissolve and the dal forms. The finish involves sautéing a small amount of onion, garlic and dried red pepper to stir into the mix to “lift” it. 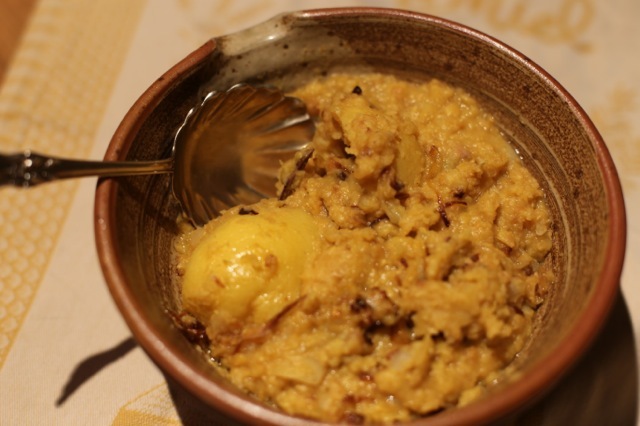 It is adapted from a recipe in Ismail Merchant’s excellent and quirky cookbook Indian Cuisine. 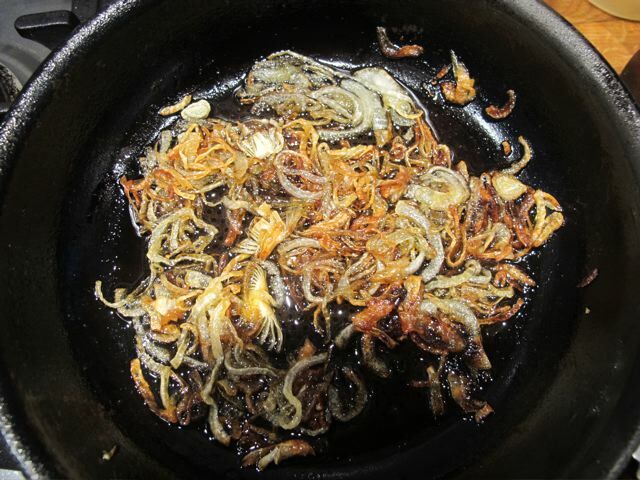 Cook the onion over a low heat in the oil until it is opaque–about five minutes. Add the lentils, cinnamon and the ginger and mix in. Cook these together gently for about ten minutes, keeping the heat low and stirring from time to time to avoid them sticking to the bottom of the pan and burning. A nutty aroma starts to rise from the darkening lentils, as they cook. Add the stock and hot water, cayenne and salt. Cook gently for a further ten minutes, then add the lemon juice and the empty lemon halves and stir it all together. Cover the pan and continue cooking on a very low heat–use a heat diffuser if necessary–for 45 minutes, stirring occasionally to avoid sticking. 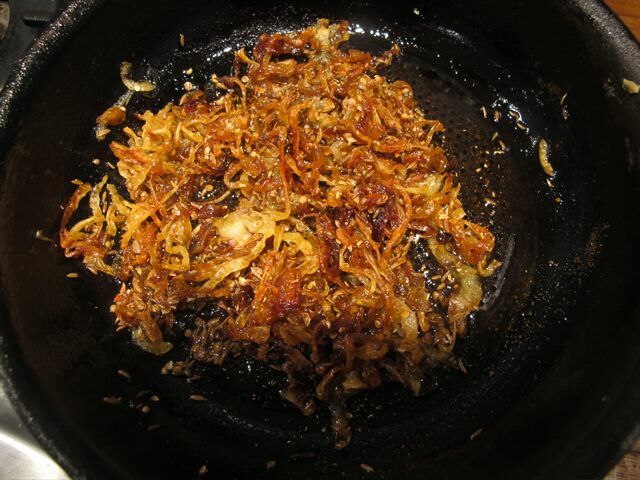 In a small frying pan heat the tablespoon of olive oil and add the sliced onion. Let this color for five minutes over a medium heat. Add the chili and the sliced garlic and continue cooking until the garlic begins to brown. Add this to the lentils and mix it in. I got to see the dentist yesterday and she rounded off the jagged bit and told me to come back for a crown fitting. Oh no! dentist visit(s), hassle, painful, waste of time–damn! Bought a cauliflower this morning. There wasn’t a lot of choice–it’s freezing cold and the local growers’ produce is limited. I flick through this cook book and that–then suddenly remember comfort lentils from Delicious Dishes for Diabetics. COMFORT is the key word. Outside it’s damp and cold–so comfort food that acts as an interior blanket is just what I need. I search the index for “cauliflower“. Aha! 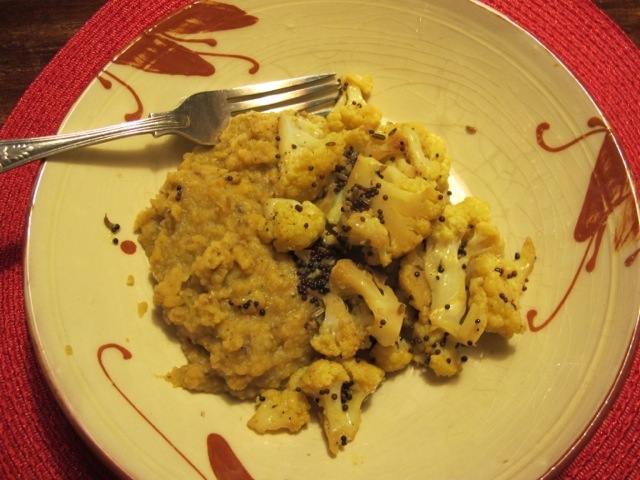 Cauliflower with mustard seeds and fennel seeds–inspired by Madhur Jaffrey. A fire in the grate and the evening holds promise! 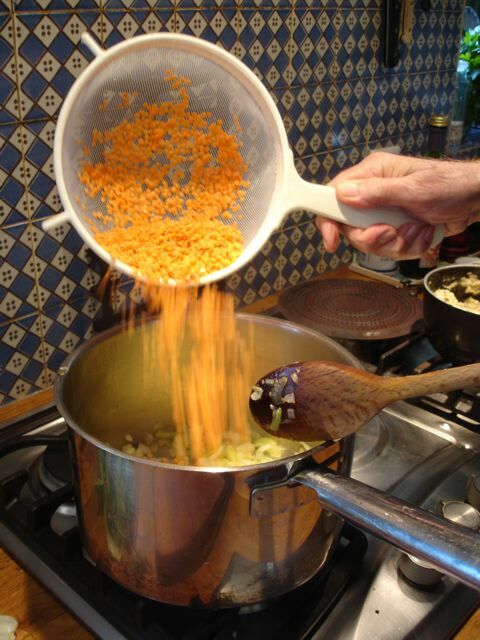 Rinse thoroughly a pound of red lentils–until the water runs clear. Add two vegetable stock cubes to a litre of water and bring to the simmer. 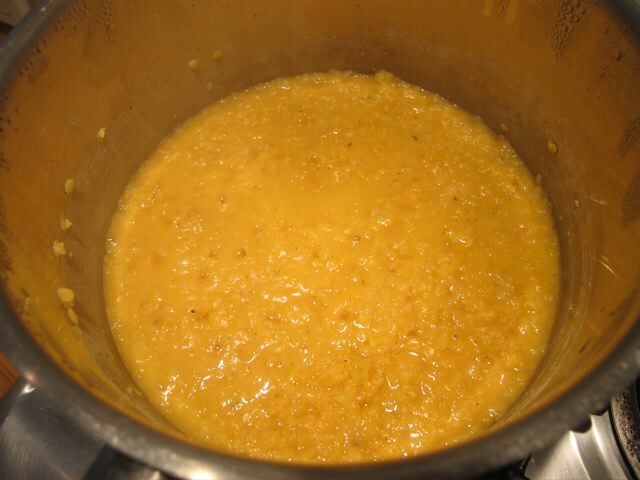 Cover and simmer gently, stirring occasionally, until the lentils are cooked–about 20 minutes. Meanwhile chop a medium onion and in a separate pan color it gently in four tablespoons of olive oil . One and half teaspoons cumin powder; one teaspoon coriander powder; half teaspoon cayenne powder; and (if you have it) one teaspoon garam masala. Cook the onion in the spices for a couple of minutes and then stir this mix into the lentils. Deconstruct a large cauliflower into bite size pieces. Heat six tablespoons of olive oil in a pan (large enough to hold the cauliflower in a single layer–more or less–but don’t add the cauliflower yet!). Add a tablespoon of black mustard seeds and two teaspoons of fennel seeds. When they start to pop–add three garlic cloves chopped fine. When they start to color add a quarter teaspoon each of turmeric and cayenne powder. 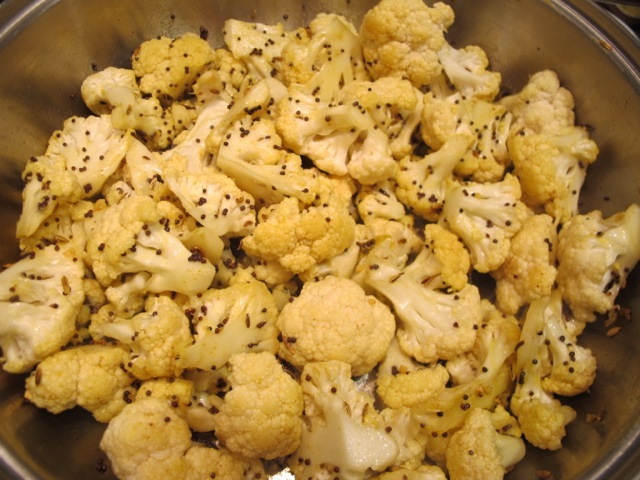 Cook these briefly to release their aroma–and then stir in the cauliflower pieces. Turn these thoroughly in the spicy oil and add four tablespoons of warm water. 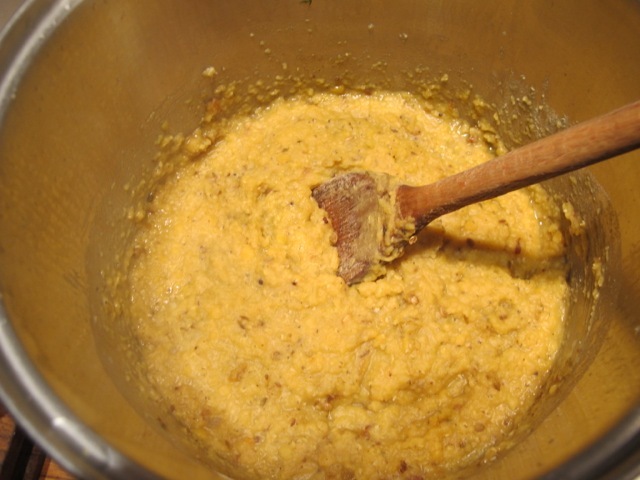 Add a decent pinch of salt and cook covered until the cauliflower is tender–about 20 minutes. These two comforting friends make good partners for a chilly winter night. Meredith, who used to think that cauliflower was a pointless vegetable, had seconds! We arrived back home at midday yesterday, after a hair-raising, heart-stopping near miss of our Toulouse connection at Heathrow. It was always going the a bit tight, but worth the risk we thought, as the next connection left six hours later. We waited our turn for a hand search after three of our bags were side-lined going through the X-ray machine, then watched the security staff carry out their essential, life saving duties–in aspic, it seemed. “Last call–this flight is closing!” We made it by a hair’s breath after a long dash. I’m trying to avoid going shopping today–recovery mode at St. Martin. But what’s there to eat–the fridge and larder are low on fresh produce after our month long trip. 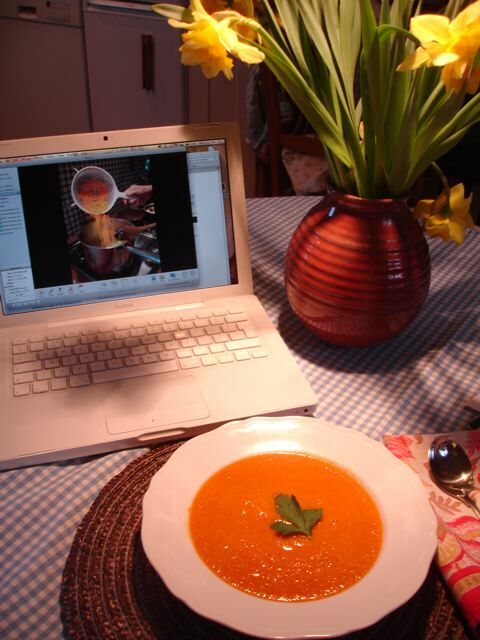 Ismail’s* spicy comfort soup–oh yes! And a sweet potato on the side–perfectly enough until tomorrow–with a glass of red wine. Soften the onion in the oil. 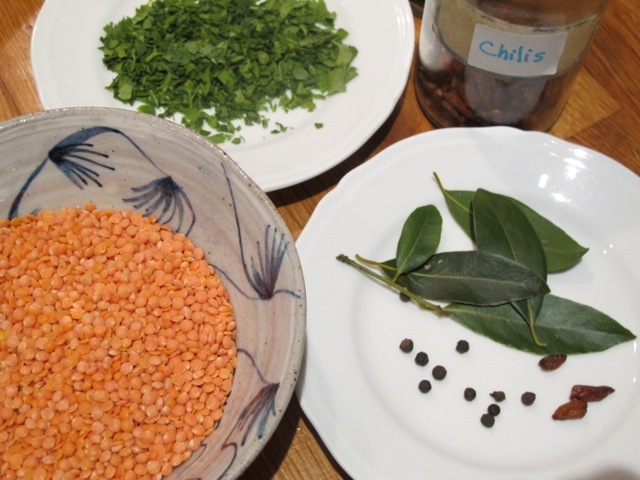 Add the bay leaves and the peppercorns and cook a further five minutes. Add the stock with the lentils, chilis, parsley and salt and bring up to the boil. Simmer for 20 minutes until the lentils have cooked through. Serve hot–with a sprinkling of parsley on top. * the late Ismail Merchant–producer half of Merchant Ivory productions–whose touch of genius stretched into the kitchen. This was published a couple of years ago. It has been a favorite for over thirty years and is a tasty standby for a rainy grey day when going anywhere for supplies is the last thing you feel like doing. Meredith on her detox for a week mentioned it this morning and we’ll have it tonight, as below, with some of the broccoli I bought yesterday and brown basmati rice. 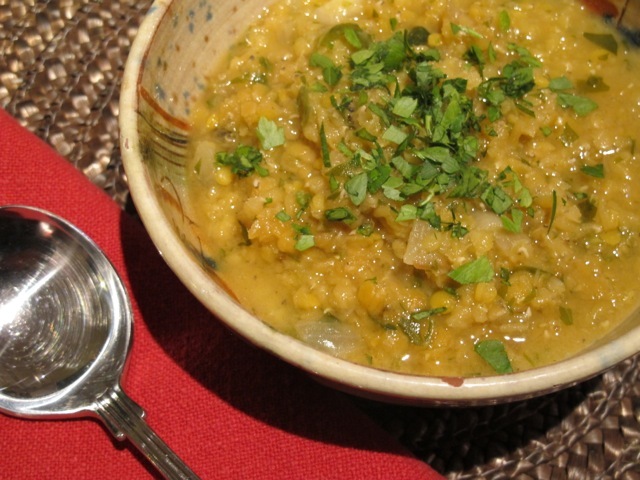 A Dal-–otherwise known as Comfort Lentils in our house. 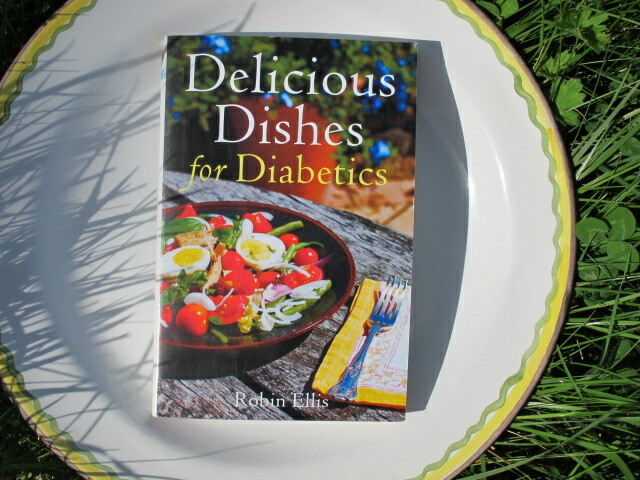 This is from my book Delicious Dishes for Diabetics–-out in the UK and officially launched November 1st in the USA. Our Sikh friend, Tari, affectionately known as the “Carefree Cook”, is an example to all us worry guts. He never panics when people turn up unexpectedly and have to be fed. He looks to see how many extra guests are coming through the door and adds more water to the dal accordingly! We’ll eat these lentils tonight with broccoli, simply steamed, drizzled with a little olive oil (maybe a squeeze of lemon?) and a some brown basmati rice. Rinse the lentils very thoroughly – until the water shows clear. Put them in a saucepan with the stock and bring gently to the boil. Turn the heat down to low and let them simmer, covered, stirring from time to time. They are done when a small puddle floats on the top. Heat the oil in a small frying pan. Add the onion and fry gently until it colours nicely. Add the spices and mix them in well. Cook for a couple of minutes longer to release the aroma. 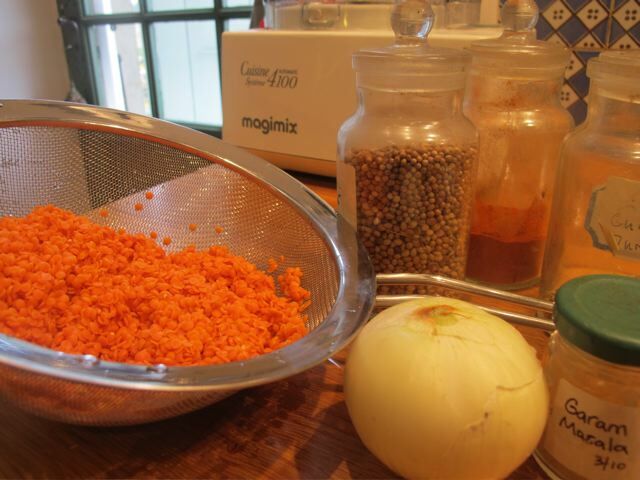 Add the cooked spices and the onion to the lentils and mix in thoroughly. Comfort food par excellence, adapted from Rose Elliott’s The Bean Book. This and her nicely-titled Not Just a Load of Lentils have been friends for years. 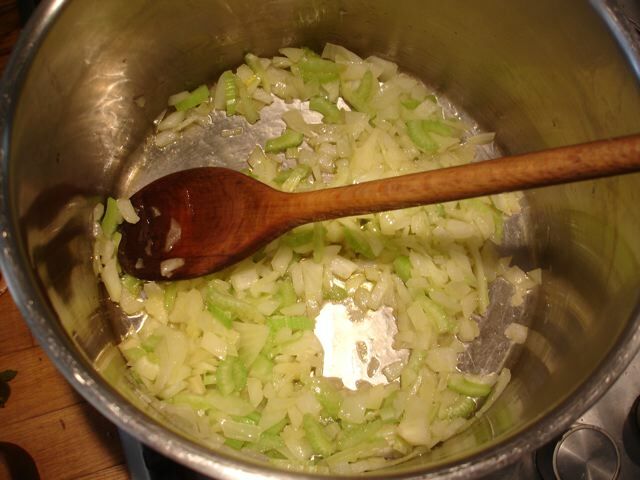 Soften the onion and celery in the oil over a low heat. Add the lentils and turn them in the mixture. Add the broken up tomatoes and the stock. stir everything thoroughly and bring to a simmer. Partially cover the pan and cook until the lentils have melted. Remove from the heat and let it cool for 5 minutes. Liquidise to a smooth finish and season to taste . Serve hot in bowls that show off the beautiful colour, with a pinch of parsley in the middle of the bowl.